Indian Chats are some of the most mouth watering food items sure to entice everyone. And observing Navratra fasts doesn’t mean you have to control your urge to have them. Potatoes form the main source of energy during these fasts and the thought of a fried potato chat is enough to bring a smile on anyone’s face. So quickly make this delicious snack and have it with a steaming cup of tea. Place a wok or deep frying pan over medium heat and pour oil in it. As soon as the oil heats up nicely, add the cut boiled potato pieces and fry them to a beautiful golden brown colour on all sides. When done, transfer to a plate lined with paper towels. Then transfer them to a mixing bowl. 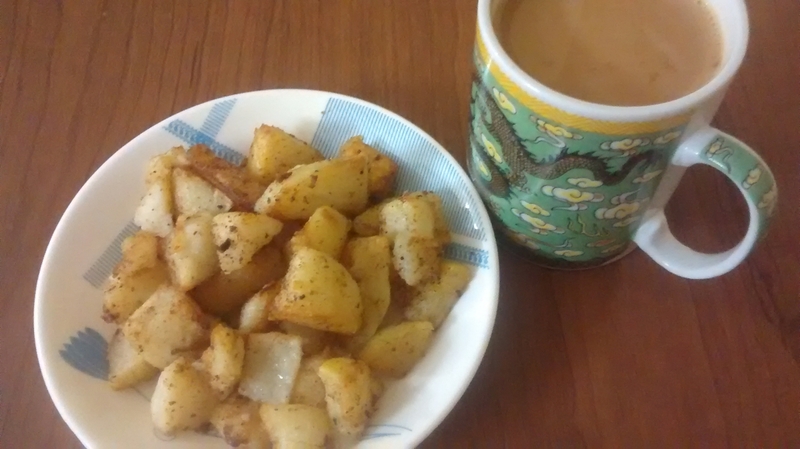 Sprinkle rock salt, red chilli powder and roasted cumin seeds powder over the fried potatoes. Also drizzle the lemon juice. Toss the potatoes to coat in the dressing nicely. Transfer to a serving plate and serve warm with a hot cup of tea.